This is a subject I’ve touched on before. What has been found is to achieve best mortgage lead conversion ratios you need to make a contact with a potential customer within 1 minutes’ time. 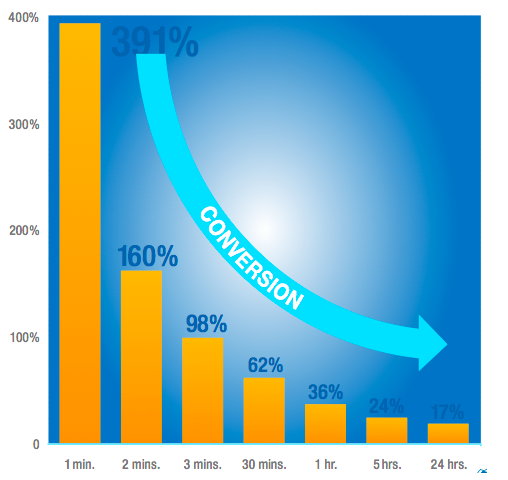 If you can achieve that, leads will convert 391% better than a lead that is contacted after a 24-hour period. Take a look a look (image courtesy Velocify). How do you manage such diligent follow up? The answer has everything to do with using an intelligent dialing system to quickly route calls to available agents. The truth is an intelligent dialing system is an absolute requisite for efficient mortgage lead contact. If you need help with that please don’t hesitate to call (877 514 8949) or email us at hello@forwardleapmarketing.com. We’ve helped establish protocols which have helped dozens of businesses get industry leading first contact rates. One other thing these systems are able to do is get your calls out so you hit the conversion sweet spot. An intelligent dialing system will help you organize calls in such a way that you offer a persistent call strategy. Keep in mind you want to optimize persistence over annoyance, as too much contact early on you risk wearing out your welcome. When you think about how much money you’re spending to get those mortgage leads this is incredibly important. If you have an intelligent dialing system in place it means you can count on mortgage leads converting at an increased rate. It’s been shown if you can make contact within the first three perfectly timed called calls, you’ll get a 45% conversion gain. It’s been shown that if a prospective mortgage leads first contact is on the 6th email or later, there is an overall reduction in conversion of around 36%. It means you need to make sure your emails get opened. All you’ve got to do is write, short, punchy, and exciting headlines (at least to your prospect) so they open your emails. A properly written 5-word email subject line could help your conversion rates skyrocket. Ideally you want them to open the very first one you send. If you’re stuck trying to figure out how to get them to open, do this. Start at the beginning. Look at what brought them into your sales funnel in the first place, and then write an email that in some way speaks to the reason they completed your form to begin with. And above all, don’t be boring! Getting someone to pay attention to your email isn’t an art as much as it is science. And science says attention matters! The other thing to do is time your emails perfectly. Its been shown with proper email delivery you can pick up a conversion gain of around 53%. Unlike phone calls, you’ll want your emails to be a bit more staggered. Remember, you want to be persistent without being annoying. Regardless of whether we get initial phone contact this is how we stage our email delivery. Typically we send on Day 1, Day 4, Day 8, Day 11, and Day 14. With those first 5 out the door we find we’re able to get that 53% conversion gain pretty regularly. Combine those two strategies and you’re talking an easy 102% increase with ZERO extra effort. Keep this in mind, this is the bottom end of the conversion gain threshold. If you’re able to bring in highly qualified mortgage leads into your sales funnel those numbers can go up significantly. Eager to make this work for your business? Don’t hesitate to call us at 877 514 8949. All it takes is a few smart moves on your part and you could see the kinds of results you dream about.